I recently put aside enough duckets to get my hands on Olivem 1000, a stand-alone emulsifier approved by EcoCert for use in natural care products. 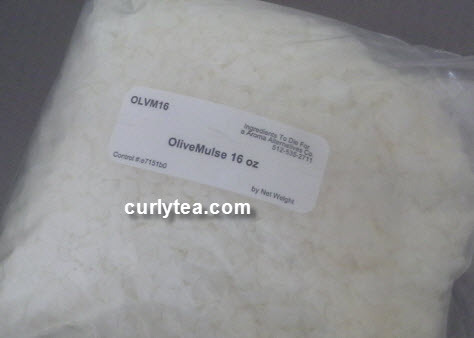 Olivem 1000 (called OliveMulse where I got it) is naturally derived from Olive oil with a mix of Cetearyl (emulsion stabilizer) and Sorbitan (sorbitol). 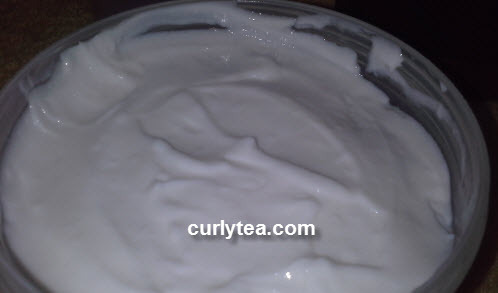 Its best used for making oil-in-water emulsions (creams with a higher percentage of water than oil). Its NON-ethoxylated, PEG-free, hypoallergenic, and isn’t made with heavy waxes. Aside from those benefits, what’s supposed to be another major selling point is it’s “liquid crystal structure” which has natural skin-loving properties. Using it also amps up the glide and feel of your final product. Not since BTMS-25 have I used an emulsifier that just…works. And works well even when you use Citric Acid… AND Aloe Vera Juice… AND Neodefend (which can lower the pH too). Unlike some emulsifiers I won’t name (*cough*EcoMulse*cough*), it doesn’t get into random fist fights with other ingredients and causing an emulsion failure. Why is that? It’s because Olivem 1000 is very tolerant of a high amount of acids (low pH ingredients). Using things like Citric acid and Aloe Vera Juice, which both have a low pH is, not supposed to cause separation of your product. 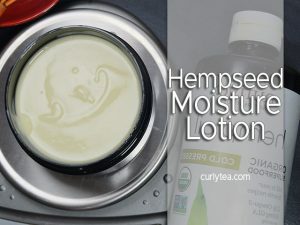 A moisturizer made with Olivem 1000 actually feels a little better in my hair the higher the percentage of oils I use. In my past experiences, the more water a mix uses, the more “glide-y” it can feel. However, Olivem 1000 is glide-y even with a nice amount of oils. It can handle a recipe using 25% oils easily, according to ingredientstodiefor.com, without turning waxy or draggy. If you used 10% oils or less in your mix and you’re not all that impressed with it after a day or two, try adding 1 or 2 TBSP (tablespoons) more oil. From my experience, it actually made my mix feel better and made it look creamier and richer. The mixes I’ve made for my hair so far absorb very quickly as well. You know how sometimes you put on a moisturizing cream or leave in, and it kinda sits on the hair for an extended period of time before it absorbs? Well, the concoctions I’ve made using Olivem 1000 don’t seem to do that. It may be because Olivem 1000 is formulated to be “non-soaping”, meaning its not supposed to have that weird, extended whitening effect when rubbed onto the skin and hair. In addition, a final product made with Olivem 1000 can change depending on what steps you used while creating it. Your final product can look/feel differently depending on WHEN you added your oils, and whether you used a stick blender OR a simple spoon/whisk/chopstick. # Slowly pour your water into your oil after you’ve heated them up separately. # Stir the oils while you’re slowly adding in the water. # Once it turns opaque, stir it for a full 3 minutes at least. # THEN, sit that bowl, mug, or mason jar inside a bigger bowl of cool water. If you use a stick blender to finish mixing it, you’ll get a thicker final product. If you use a spoon, chopstick or something to manually stir it, you’ll get a thinner final product. It may not be liquidy, but it won’t be as thick as it would’ve been had you used a stick blender. TIP: If you KNOW you used more than 3% Olivem 1000 but manual stirring with a spoon makes it look like the oils and waters are separating, hit the button on your stick blender 2 – 4 times and its like nothing happened. The 1st mix FAILED. Why? Because it is not recommended to use Olivem 1000 at so low a percentage (3%) without using a 2nd emulsifier OR something like Xanthan or Guar Gum. Many natural emulsifiers are like that too. However, the 2nd and 3rd mixes turned out very well! 5-6% of Olivem 1000 doesn’t make my mixes feel heavy, or goopy, or draggy. In comparison, 6% of BTMS may feel slightly draggy. Keep in mind that BTMS is a CONDITIONING emulsifier. It has very obvious built-in hair conditioning properties, whereas Olivem 1000 is an emulsifier with special properties (ie that “liquid crystal structure” thing mentioned above). I will have to use this for a much longer period of time to do a full comparison with BTMS. 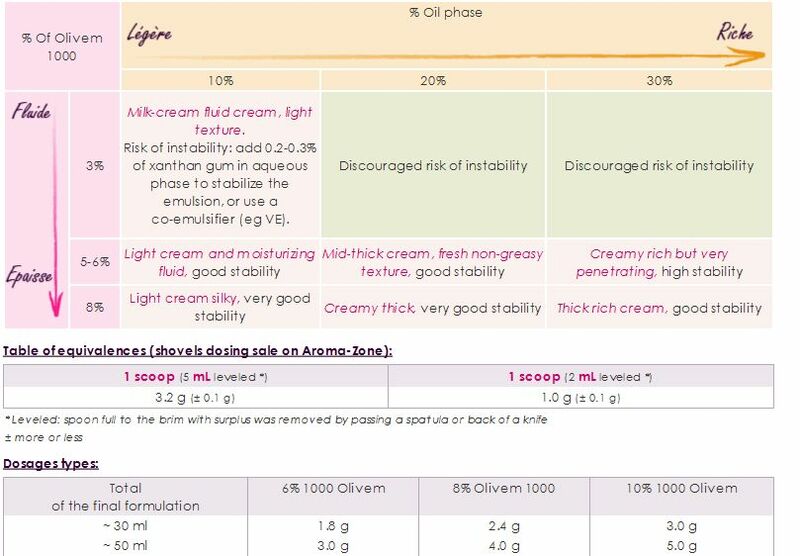 Olivem 1000 can be used in a wide variety of products including conditioners, leave-ins, baby care products, day and night creams, cream cleansers, products for sensitive skin, lotions, etc.